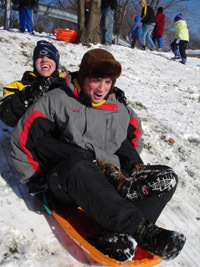 Project Overview:Children went sled riding at a local sledding hill. Rationale:In order to gain a complete concept of sled-riding, a child who is blind or visually impaired benefits from hands-on experience. Description:The children met at the Blind Association in the morning where they enjoyed lunch and explored several different styles of sleds, visually and tactually, as they waxed the bottoms. 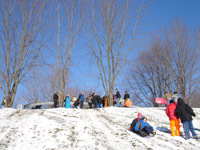 Once the sleds were prepared and the children bundled up, we headed to a local sled-riding hill. At the hill, the chaperones described the area to the children. They had the opportunity to walk down the hill first to experience just how long and steep it was. 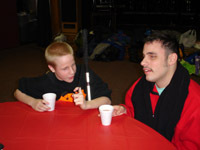 Initially each child rode down the hill with a sighted partner. This individual helped orient the child as he/she traveled back up the hill. Eventually the children had the option to go down the hill alone. Sighted chaperones at the top and bottom of the hill monitored the area as needed and indicated when it was safe for the next group of sledders to go down. Hot chocolate and snacks were available in a nearby building so the children could take a break and warm up as needed. Result:Sled riding provides children with exercise and fun. Children who are blind and visually impaired benefit from engaging in this activity in a safely monitored environment. Decide where you will take your group sledding. If it is a popular sledding spot, you should scope it out ahead of time to see how crowded it gets. Is there an indoor area where kids can warm up and rest? Get permission to use the area and indoor facility. Contact local service organizations to find volunteers to provide snacks and monitor indoor rest area. Plan for lunch. You can serve lunch at your agency before you leave or go out to a restaurant on your way to the sledding hill. Collect extra hats, scarves, gloves, etc. to have on hand for any participants who are not adequately prepared. You can also provide plastic bags that they can put over their feet inside their shoes/boots to keep them dry. Collect sleds for the activity. Find out how many children will be bringing sleds. Ask coworkers and friends to loan your group sleds for the day. It is good to have at least 1 sled for every 2 children. 11:45 Prepare sleds and bundle up. Have students explore several different styles of sleds. They can also help wax the sleds.